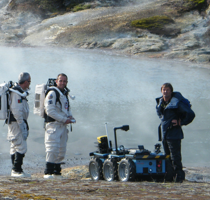 Last summer, the robuROC6 mobile robot travelled through the wild landscape of Iceland, with the Ushuaïa Nature team of Nicolas Hulot. The movie scenario of “We walked on Iceland” consisted in discovering the so beautiful landscape of the young nature of Iceland, emerging only 20 million years ego. Exploring extremes in the great outdoors, robuROC6 moved on rough non-cohesive terrain as snow or on rocks, demonstrating its capabilities to evolve in such critical conditions. With its three monocycle modules linked together with roll and pitch joints, it adapted its shape to the geometry of the natural grounds, filming and scanning accurately its environment. For sure, our robot was in its element!